Holy smokes, we made it to daytime television! This past Wednesday we were featured on the Daytime Blue Ridge program at the local WSLS new station in Roanoke, VA. Jamie of Macaroni Kid Roanoke comissioned us for Super Bowl printables to display for her television spot and we were all too happy to help her out. Check out the program here for some really cool Super Bowl idea to keep the kids busy and happy during the game! It was a warm pleasant early spring day. The kind you hope for all winter long. The kind that make you want to spend all day outside soaking in every last ray in the hopes that it will hold you over until the next one comes along and winter breaks for good. A perfect weather day in my book. (Perfect weather makes me very happy and always increases my mood exponentially.) Jason and I were on a road trip, destination Charlotte, NC. Well technically Davidson, NC, but tomatoe/tomato one is right outside the other. The cooler was in the back filled to the brim with cupcakes, we journeyed south for three hours. Our mission: Deliver Honey Bee cupcakes to Justin & Mary Marantz and Julia (J2 their wonderful assistant) for their Walk Through a Wedding w/ J&M Workshop. Theme: American Honey. Justin & Mary are a husband and wife photography team based out of New Haven, Connecticut. We have found them to be very inspiring along the entrepreneurial path/adventure that we have been on for the past year. They write an extremely comprehensive and motivational blog to accompany their photographs, inspiring even the smallest of business owners and startups to follow their dream, stay true to themselves, and never give up trying! 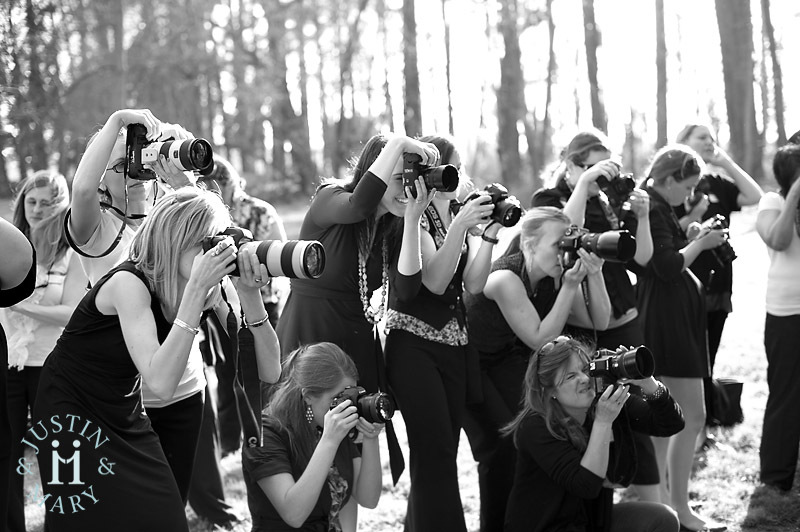 Walk Through a Wedding Workshop Attendees making magic! Sounds cool, what in the world does that have to do with cupcakes? Cupcakes are an integral part of any wedding reception dontcha know? Once we read about the theme for the The Walk Through a Wedding w/ J&M Workshop in Charlotte (the closest they would be traveling to us), American Honey and saw their dreamy dreamboard of visionary wonderment that inspires the entire day of the workshop, we decided to make contact. 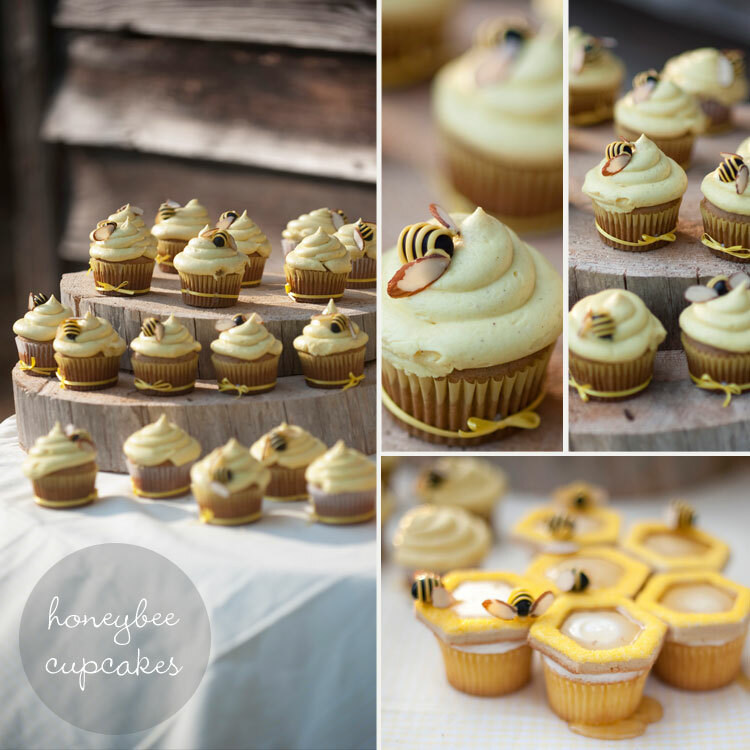 See we had a vision too, of honey bee cupcakes, something we had been meaning to try, photograph and get up on our website! Plus the opportunity to be a part of anything business related with J&M had us pumped since we read their blog all the time! So we shot an email over with the idea and lo and behold, they said sure! Our honey bee cupcakes with delicious banana cake and fresh honey buttercream, perched atop charming DIY cake stands, being photographed and consumed by a whole lotta people, makes us happy campers. Plus J&M and J2 just seem like really cool, nice, happy, salt of the earth type people. People like that you just want to do things for, be a part of all that goodness. Or as they like to say, "Spread the Love." So now that you know all about J&M, the workshop and why we wanted to participate I guess it's time to get down to the good part. What happened once we arrived. Once in Charlotte and we located the workshop reception venue at Beaver Dam, (we were the first ones there making us nervous that we were in fact in the right place), we hauled our cupcakes into the house and spoke breifly with the venue management on staff there. Yes we were in the right place, yes we were the first ones there, no we did not miss the whole thing, etc. Whew! With our fears out of the way we ventured out to find a bite to eat with plans to return in one hour. We got distracted by a shiny object (Homegoods) and ending up not eating at all. You have to understand that we do not live in an area that is blessed with great shopping. Bare bones is more like it, in the middle of nowhere at the time. A store like Homegoods is too wonderful for us to pass up, we ignored our tummies and oooh'd and ahhh'd over the merchandise. One hour later we pryed ourselves away from Homegoods and hopped back into the truck. We arrived at the venue right on time this go round, and by on-time I mean 20 minutes later than we planned to, but just as everyone else was pulling up the drive as well. Yay! We nervously hopped out of the truck and walked over to the rest of the group that had just arrived, looking for Julia (J2) who is in charge of setting up the faux reception and our main point of contact throughout the preparation for our trip. Ok admittedly I was the nervous one, Jason doesn't get nervous about meeting people and usually ends up reassuring me constantly during all my social anxiety awkwardness. Meeting Julia was great, she was super friendly and super nice in just the way I envisioned. She hugged us both, "we hug", she proclaims. Hugging cuts through all the nervous for me and puts my worries at ease. Everyone gushes over the cupcakes appropriately and we give breif instructions on honey pouring and then before you know we we are out the door and on our way home. We would have loved to have stayed and watched the whole workshop, possibly meet J&M and watch them work their magic, but I have a huge fear of being in the way and taking up precious space so I thought it best to just deliver and get on outta there. Now for the good stuff, pictures! Who knew our cupcakes could look so good? All photos are courtesy of Justin & Mary Photography. We would like to thank Justin & Mary for allowing us to be a part of something totally new to us and inspiring, and thank you to Julia for being so creative and making our cupcakes shine! Stop by Laker Beverage & Tobacco tomorrow mid-day for their Grand Opening event with shop owner's Cindy & Mike Gray! Hello My Sweet cupcakes will be there for everyone to enjoy as well. We baked up Gingerbread, Candy Cane, Banana Split and S'mores cupcake mini's just for the occasion! Laker Beverage & Tobacco offers a variety of tobacco products, wines, beers, gourmet foods such as Boar's Head, snacks, accessories including glasses and mugs, gift items and gift baskets. Wines include Virginia, domestic and imports. If they don't have a particular in stock, they can special-order it. They also offer wine tastings Fridays from 5 p.m. until 7 p.m. and all day Saturdays. The store carries both regular domestic beers and specialty microbrews. They carry the largest selection of specialty and craft beers at the lake. Gray said they're also installing a humidor and will sell specialty cigars from around the world. The store is open Monday through Saturday, 9 a.m. to 6 p.m. The store will begin opening earlier during the week when its coffee bar is ready; they will be serving Honduran coffee. Laker Beverage & Tobacco is located 13860 Booker T. Washington Highway, Suite 103, Moneta. The Little Gallery on Smith Mountain Lake at Bridgewater Plaza is hosting an open house Saturday & Sunday (Dec. 4-5th) from 1pm - 4pm. They are offering 10% off today's purchases and complementary gift wrapping, as well as cupcakes from your's truly! The Little Gallery has something for everyone. Come by and take a peek and check a few people off of your shopping list! We are so honored and proud to be a part of the Booker T. Washington National Monument Grand Opening Event for their new addition to the Visitor Center. The Grand Opening Event is being held at 11am on Wednesday, November 17th, 2010. Our Fun Cupcakes will be present and abundant with a "Farm & Garden" theme that will be too cute to miss, as well as many Fancy Cupcakes in our Seasonal Fall Flavors. Booker T. Washington National Monument commemorates the birthplace of America's most prominent African American educator and orator of the late nineteenth and early twentieth centuries. 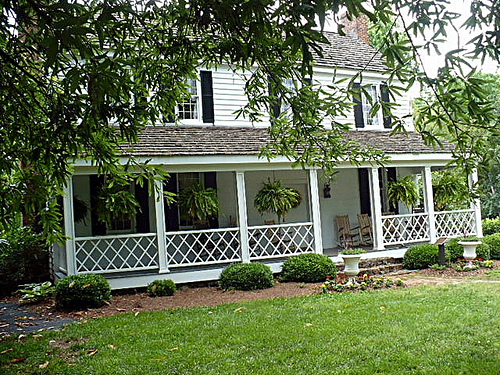 The property evokes an 1850s middle class tobacco farm, representative of Booker T. Washington's enslaved childhood at the Burroughs farm. He was born in 1856 to the Burroughses' cook, Jane and lived on the farm throughout the Civil War. To learn more about Booker T. Washington, his life and accomplishments, visit the park! We are so fortunate to have a National Monument & Park located in our backyard! Open seven days a week, year-round, 9:00 a.m. to 5:00 p.m. Click this link for directions to the park. The Grand Opening event was a huge success and many many people from he community came out to celebrate the new wing of the Visitor's Center. We conversed and mingled and ate and had a great time. Hello My Sweet would like to thank the Booker T. Washington Friends Group as well as the Park Service staff for allowing us to be a part of your special day. Thank you so much! We had the pleasure of being a vendor at the annual Fall Festival for Dudley Elementary School here in Franklin County, VA. This was a first for us and we really went overboard with the cupcakes, making about 9 dz total! We learned a few things during the evening, the first of which was, chocolate is the most popular flavor. 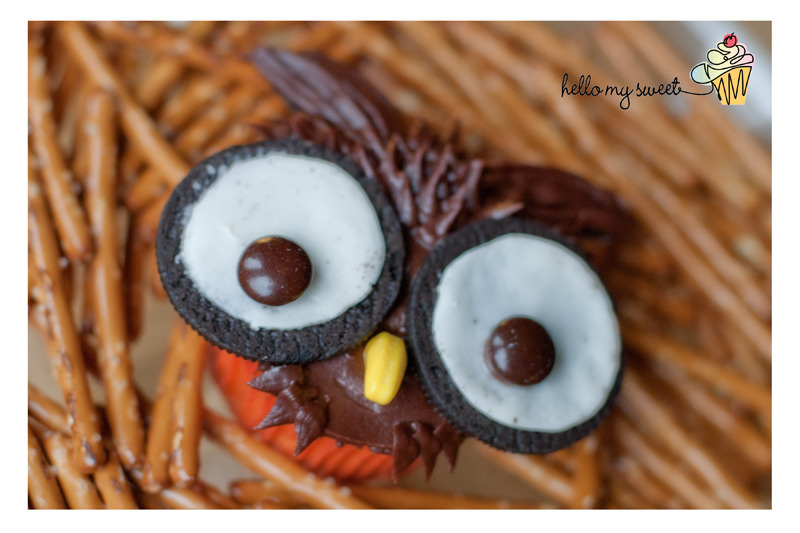 Secondly, everyone thinks cupcakes that look like Owls are super cute, including us. We sold out of our owls first, they truly were a hit. Third, kids like grotesque Halloween themed cupcakes. Our Gooey Brain cupcakes were the second most popular of the night and not just with the fellas. We would like to thank the staff and PTO of Dudley Elementary School for allowing us the opportunity to serve you at the Fall Festival. We look forward to doing it again next year!